Welcome to The Grand Entrance!!! 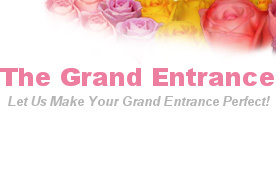 Established in 2002, The Grand Entrance offers quality professional services at an affordable price. Planning your wedding day or special occasion just got easier! We strive to offer complete services including our full service salon/spa (hair care, manicures, parafin wax, pedicures, facials, detoxing, massage therapy, spray tanning), reception & party ideas, and a full line of the most beautiful gowns and tuxedos in the area. Our staff will always go the extra mile to ensure that you receive the pampering and caring service that you deserve. Let us make your Grand Entrance perfect! Salon: 103 West Market Street, Gratz, PA 17030 (Entrance on North Pine Street). (717) 365-3281. Everything your special occasion needs: Gowns & Apparel: Bridal, Bridesmaid, Flower Girl, Mother Gowns, Headpieces and Veils, Shoes, Gloves, Jewelry, Alterations, Tuxedos and Suit Rental and Retail. Professional Services: Floral Designer, Hairstylist, Make-Up Artist, Nail Tech, Spray Tanning, and Massage Therapy. Join us on our Facebook page, Grand Entrance, for additional pictures and comments.